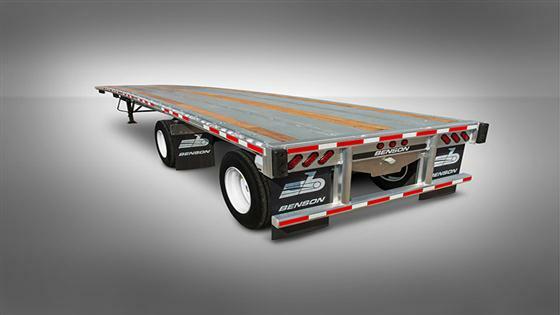 The ultimate in performance, the Benson Trailers aluminum platforms provide exceptional fuel economy, corrosion resistance and increased payloads. Known for its fleet-proven design, this trailer offers greater load and operating flexibility, lower maintenance and longer trailer life. Ideal for owner operators and large fleets alike, this trailer will meet all the requirements for your specific application. After this trailer, you won’t want to pull anything else. Superior Main Beam Design. Lower Maintenance. The two-piece, welded main beam design eliminates the need for mechanical fasteners by welding on the neutral axis of the main beam where bending stress is minimal. Unlike bolted designs, this main beam doesn’t have fasteners, which eventually loosen, requiring additional maintenance over its lifetime. Floor crossmembers weld to the main beam, side rail and floor to form a super stiff structure, eliminating the need for knee braces for a lighter weight trailer and less maintenance. In addition, the extruded, hollow core, aluminum floor system welds to the top flange of the main beam, creating a stronger beam section while also reducing weight. Greater Flexibility. More Loaded Miles. The Lock-Rite™ multi-position tie down system offers flexibility to either tie down narrow loads to the center of the trailer or to the outside siderails. This patent-pending design also allows the use of either straps or chain ties to secure loads. 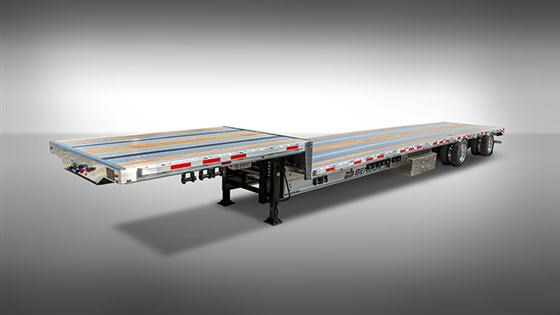 In addition, this flatbed comes standard with five additional crossmembers to support steel coil hauls. An optional full-length coil package is available.